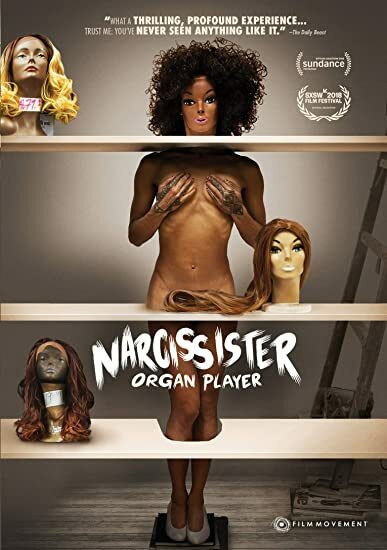 Narcissister Organ Player - BUY THIS BLU-RAY! One of the contemporary art world's most acclaimed mixed-media & performance artists, the masked and merkin-clad Narcissister is the subject of this smart, sassy documentary that showcases her spectacle-rich approach to explorations of gender, racial identity, and sexuality. Directed by the enigmatic artist herself, the film deconstructs her celebrated stage shows which combine dance, elaborate costumes, pop music hits, unabashed eroticism and heavy doses of humor. From public outings with Marilyn Manson, to a stint on America's Got Talent - Narcissister is no stranger to the spotlight. This doc goes behind her iconic mask - revealing her experience growing up and feeling ostracized in blonde-haired, blue-eyed Southern California as the child of a Sephardic Jewish mother and an African-American father. As Narcissister pushes the boundaries of contemporary art, she must also contend with the waning health of her biggest champion: her eccentric and loving mother. With as much to say about self-love as self-loathing in women's lives, Narcissister Organ Player is a thrilling, profound and utterly moving experience. Bonus features include two deleted scenes.